The world has collectively endorsed the goals, targets, and indicators that make up the Sustainable Development Goals (SDGs), and we are already 126 days into implementation. You’d think it would be time to get down to business, right? As it turns out, the 230 individual indicators that make up the SDGs are not quite ready for primetime, and the decision not to consider data availability during goal and target selection may come back to haunt SDG implementation. While data availability was not necessarily one of the criteria for selecting indicators, the lack of publicly available data exposes how much work needs to be done to fully implement and monitor the SDGs. A number of fundamental questions currently plague the SDG indicators. How many actually have data? If there are available data, how many countries are covered? For how many years are data available? To truly measure progress for each of the 17 goals, indicators should cover all 193 UN member states and multiple years so the indicator is trackable, as well as have some level of relevant disaggregation. Unable to find an up-to-date, comprehensive breakdown of data availability across the 193 UN member states, we decided to answer these questions ourselves. We tracked down as many of the 230 indicators as possible and quantitatively measured data availability from 2000-2015 for all 193 UN member states. Just 42% of indicators are Tier I, meaning that they have an established methodology and regularly accessible data, according to the IAEG-SDG. Only 62% of Tier 1 indicators – or 25% of all indicators – could be found online in a publicly accessible format. A few other organizations have begun exploring whether the SDG indicators are ready to be used, but none have taken a birds-eye look at all 230 indicators. The Sustainable Development Solutions Network (SDSN) explored data availability, giving each indicator a preliminary assessment. SDSN also created the SDG Index and Dashboard using only 39 indicators with at least 80% country coverage. The Bertlesmann Foundation scoped data availability for two “snapshot indicators” per goal to see if rich countries were prepared for SDG implementation. The IAEG-SDG has classified indicators into three categories based on the soundness of methodology and the availability of data. Tier I indicators have an established methodology and regularly produced data; Tier II indicators have an established methodology but not regularly produced data; and Tier III indicators are indicators with no established methodology. 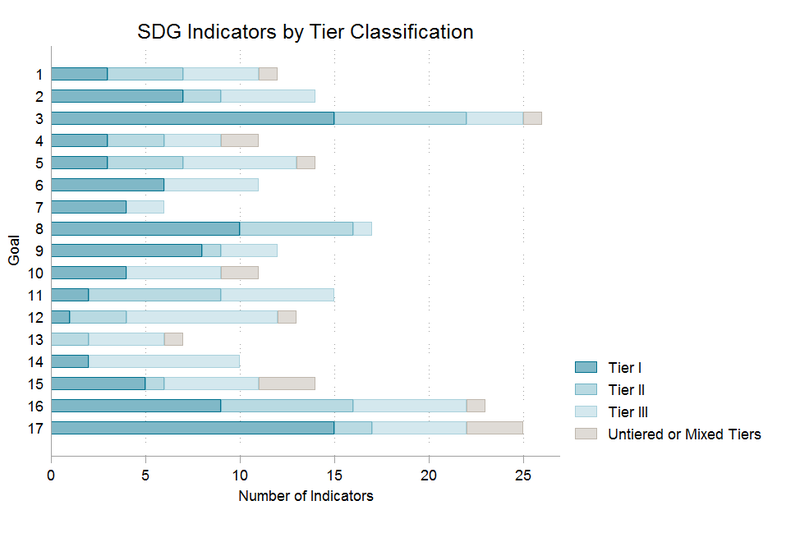 As it stands, the IAEG-SDGs categorizes 97 indicators as Tier I (that’s roughly 42% of all indicators). This means that less than half of the indicators have regularly produced data. The tiering of the indicators helps to identify major data gaps as Tier I indicators are not distributed equally across the 17 goals. For some goals the majority of the indicators are Tier I, implying a high – although not necessarily perfect – level of data coverage. As seen in the chart above, this is true of goal 7 (affordable and clean energy) and goal 9 (industry, innovation, and infrastructure). On the other hand, goal 13 (climate action) has zero Tier I indicators, meaning that there is currently no single indicator with an established methodology and available data to track progress. However, the tiering of indicators does not give a full picture of data availability. We wanted to scope whether this regularly produced data are actually publicly available and to what extent data are available in terms of country coverage and survey frequency. We found that Goal 14 (life below water) has no publicly available data. The data are behind a paywall; e.g. indicator 9.c.1: Proportion of population covered by a mobile network, by technology. The indicator is available from the International Telecommunications Union’s (ITU) World Telecommunications/ICT Indicators database, available for purchase on ITU’s website. The data require time-consuming, technical calculation; e.g. indicator 15.1.2: Proportion of important sites for terrestrial and freshwater biodiversity that are covered by protected areas, by ecosystem type. GIS data are available for this indicator, but the actual values must be calculated. The methodology is unclear; e.g. indicators 10.6.1 and 16.8.1: Proportion of members and voting rights of developing countries in international organizations. It is not clear which international organizations are considered. The data cannot be found; e.g. indicator 15.7.1: Proportion of traded wildlife that was poached or illicitly trafficked. Additionally, fifteen Tier 1 indicators are not directly available and require a relatively simple calculation using publicly available data. For example, indicator 17.11.1 is developing countries’ and least developed countries’ share of global export, but the World Bank’s World Integrated Trade Solution (WITS) database only provides data on the global exports of each country in US dollars are available. The SDG-specific indicator is not available on WITS’ database; instead, the export data must be downloaded and then calculated. 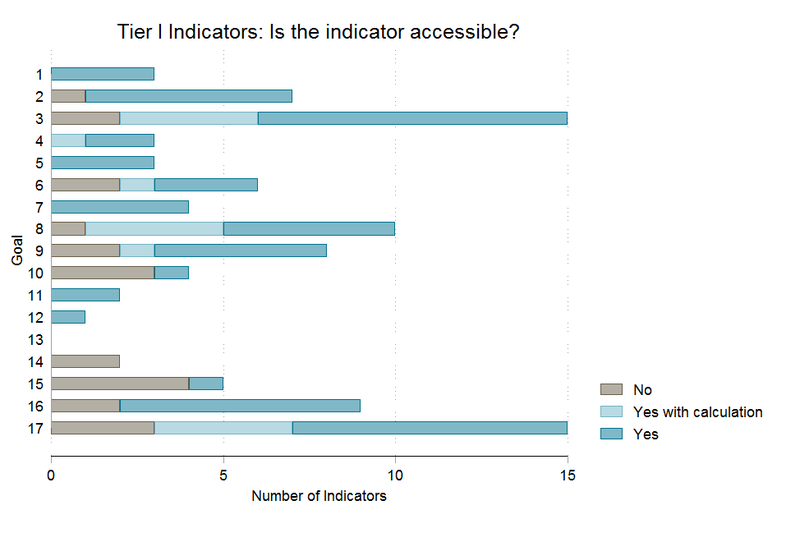 In sum, only 62% of Tier I indicators have direct, publicly accessible data. This is only 25% of all SDG indicators. Without publicly accessible data, citizens and external groups cannot keep UN member states accountable for their progress in implementing each of the goals. Even the agenda’s cornerstone indicator on extreme poverty (indicator 1.1.1) lacks data on 72 countries over the last 15 years. Much more work needs to be done – especially around goals 11-15 – to establish baselines and allow for the monitoring of progress in each goal. Despite the jarring data gaps, there is still some room for data assessment around the SDG indicators. Stay tuned for further analysis on the SDG indicators as we explore which indicators are lacking data, what countries and regions have a dearth of data, and what agencies are failing to provide data.